I spent Saturday to Monday skiing from the North Fork Cascade River to Highway 20 via the Isolation Traverse with my wife and my good friend Kurt Hicks. We made a few variations on the classic route, much to our delight. Among other things, we skied a 2800'+ couloir off Backbone Ridge to the lower McAllister Glacier. In all, perhaps the best ski traverse I've ever done, and maybe the best ski line of any of our lives. I'll supply a summary here with potentially useful tidbits regarding current conditions, and a little bit of gratuitous stoke for good measure. After parking a car at the Pyramid Lake trailhead, we drove to milepost 13 on the CRR and began walking. Though the snow is melting fast, a decent size tree is down at MP 14.5, so bring a saw! We skinned and then booted the Eldo climber's trail (10-30cm coverage until the boulder field, which is fully buried). We camped just before crossing the divide to the Eldorado drainage. On Sunday we gained the McAllister the usual way, and skied right down toward the icefall. We looked for a series of ramps I'd spied in a photo that might let us all the way down to the valley bottom, but got hung up by some cliffs and rather daunting seracs. So we skinned back up and headed toward the "classic crossing" onto the west side of Backbone Ridge. We decided to follow a recent skin track to the obvious col you see on the map--the one north of the classic crossing. We ran into some friends there, and used their nice slung horn to make a 15m rappel to gain the West side. We skied a short ways north and scampered up to the entrance of a couloir I noticed on the map some years back and later photographed from a plane: it's long, straight, and super committing: several hundred feet of 40-45 couloir, followed by a schrund, followed by a perched snowfield, followed by a narrow chute down on to the glacier. It's dang close to 3,000' long, and you get another 1,000 of fun turns on the glacier below. Duly satisfied, we toured north to meet back up with the classic Isolation Itinerary. I've always wanted to visit this valley, and now I have. On Monday we skied over Isolation as per usual, then over the Neve, and finally detoured up to the summit of Pyramid. From there we tried the cirque to the NW. It went, but barely, with some long traverses above big cliffs draped in blue ice. It might go more directly in fatter conditions or for more daring skiers. Lastly, not to rub it in, I will note that EVERY run was impeccable, stable pow, with the exception of about 1000' of breaker in the avi path under Pyramid. Just unforgettable. We skied to the trail at about 1600' and walked the half mile down to the car. Excellent! This traverse is just...incredible. Truly one of my favorites. That awesome cooler you mention is one I have wanted to go back and ski, assuming it's the one I am thinking of. It exits on to the lower section of the McAllister glacier, below the main icefall, is that right? When I did this traverse years ago, we made the mistake of going north to south and instead sucked up a soul-crushing boot up that monster. The entire time I was kicking myself, thinking of how much better it would have been to ski down it! The lower McAllister glacier cirque is beyond words incredible. We saw your car on Saturday, so I was wondering how it was you got out without doing the standard traverse from Colonial glacier to the knob beneath Pyramid. I'm guessing your ski down from Pyramid exited in to the valley near Pyramid Creek, and you probably saw our morass of ski and skin tracks all throughout that basin? Good call on avoiding the sun baked traverse...it was getting pelted all day Sunday and Monday and looked to be less than fun, with an added dose of death-fear adrenaline thrown in. You sure aren't kidding about the snow conditions; truly top notch, and with sunshine to boot! The perfect Winter-to-Spring transition weekend. I sent you a FB message, I'd love to exchange some info when you have some time, as I definitely plan on repeating this traverse South-to-North in the next few seasons. Any sign of another group along the traverse? There was a pickup truck parked at the Pyramid Lake TH when we went up Saturday, and it was still there on Monday night when we left. What an amazing trip it was! It is such a pity to travel across some of the most incredible terrain the North Cascades has to offer and merely use my phone to take photos. But, nevertheless, it was hard to take a bad shot. thanks for reminding me how flavorful envy can taste. Superbe couloir Forrest! Bravo, cela fait envie. A+ (and that's not a grade). So cool. Glad you got it! Amazing once again. Beautiful trip McBrians! Pretty flipping amazing terrain and skiing! Forest! Nice work. I look forward to exploring that area thoroughly this May. I'm praying for clear skies and excellent corn. The McCallister truly is one of this world's natural wonders. It's cool to see this trip being done in winter conditions. This looks like a great variation. When we first did the Isolation Traverse, I thought going in winter was perhaps a mistake. But we went the wrong direction (north to south), and today you can use much wider skis. Gary and I were on 70mm alpine skis and we were both skiing in climbing boots. Things really have changed in thirty years. 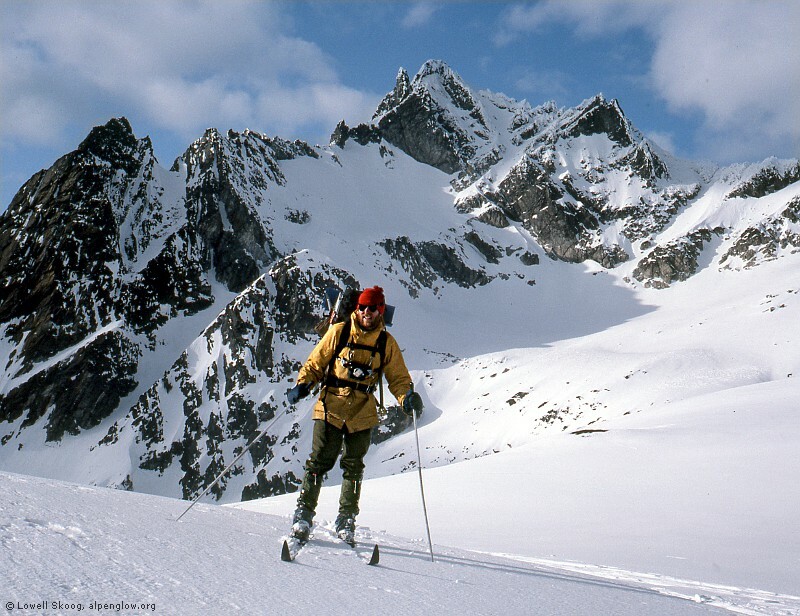 But the Isolation Traverse is still one of the most practical multi-day tours in the North Cascades to do in winter. It has reasonable road access at both ends, something many of the other long traverses don't have. "They're gonna have to rename this thing!" Here is a link to see a video of our trip. Enjoy! Great report Forest! Thanks for the great pics! Thanks for sharing that story about your brother Lowell. What a history you 2 had in the area. I definitely have a new must do on my list, and I will definitely be thinking of you and your brothers adventures so many years ago. Awesome!! Great video, Erin! And I enjoyed re-reading your report, Lowell, great photo...amazing to think of how much more challenging a traverse like this without the benefit of modern skis we all now enjoy. My stoke is high to get back and do this thing S-to-N! Outstanding job Erin, Forrest and Kurt! amazing looking variation that is now on the list...thanks for sharing and great catching up at Red Rock Rendezvous Erin!